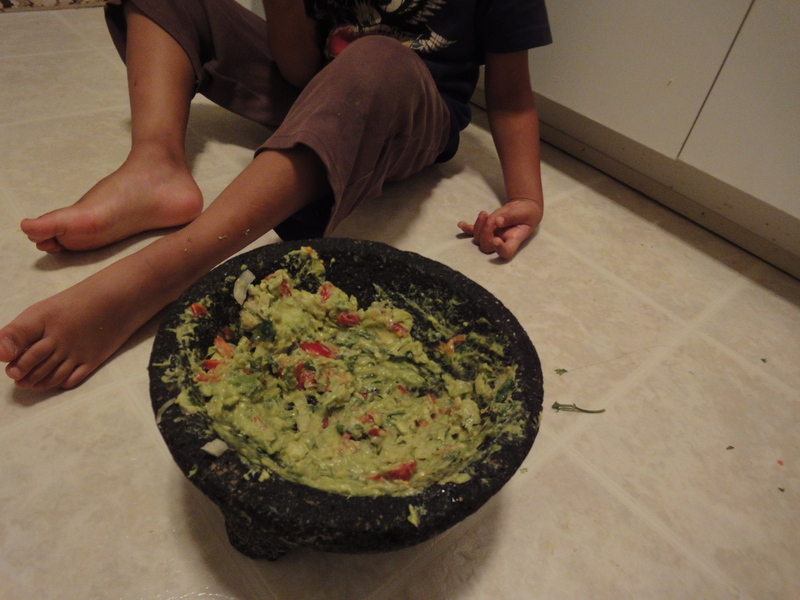 Agastya has always been in my kitchen, but recently I’ve discovered that he can make guacamole. If I give him a soft avocado split in half, he scoops out the flesh and pounds it in the molcajete. A little sprinkle of salt, and it’s almost good enough to eat. If there is onion at home, I chop a little and give it to him to add to his dish. Tomato adds a sweet-tart and finger-licking yumminess to the guacamole. I never seem to have limes or jalapenos/serranos or cilantro around all the time, but any or all of them add texture and flavor and interest to the guacamole. I would recommend adding these, including tomatoes and onions, cautiously and in small quantities, as they can otherwise overpower the subtle creaminess of the avocado. Most children love avocado, and it’s often a recommended first food for babies. Missing in the above picture is my nine-month old, who is always hovering around any food in the kitchen. He especially loves the guacamole and will lunge full-body into the stone vessel for his share of the feast. 1. First, in a molcajete, pound together the onion, tomato, cilantro, and jalapeno (if using). Then add the chunks of avocado. Smash together. Leave in a few whole pieces of avocado. Add a sprinkle of salt and lime juice to taste. There may be little or no need for lime juice if using tomatoes. 2. Serve immediately with tortilla chips. My favorite brand is Xochitl. First, dot the big avocado seeds across your guacamole after you make it to preserve freshness. Use white onions and plum tomatoes that have their pulpy center removed. And use deseeded serrano peppers for a sharper flavor. I’ve typed in their ingredients below. Absolutely loved the piece and the picture too.. Can’t wait to see you soon!